Dr. Gerald Kieschnick has combined some of his best writings on a variety of everyday topics into this collection, which will encourage you to turn to God's Word for comfort in this life. This comprehensive look at the life and role of Philipp of Hesse invites readers to take a deeper look at the intertwining history of the Church, the Reformation, and politics. [NQP] What Child Is This? Faith That Sees through the Culture provides lenses to evaluate and bring clarity to seeming paradoxes in the Bible. The Growing in Faith Bible is designed for children ages 6 through 10 as they grow in their relationship with their Savior. Presented in an easy-to-navigate format with colorful spreads, engaging illustrations, charts, and callouts, this accessible, open-design layout lets you experience the catechism like never before. Reading Isaiah with Luther explains Luther's view of the conscience and applies it to your life. Never Forsaken tells the stories of others who have suffered miscarriage and infant loss and will encourage you to look to Gods Word for hope. Sexuality Mentality encourages parents, pastors, teachers, and youth workers to have honest conversations with teens about sexual integrity. Set to the familiar rhythm of the classic Christmas rhyme, The Night before Jesus tells the true story of Christmas. In Digitized, Bernard Bull encourages readers to seek a biblical perspective about technology—for today and for tomorrow. Join Heinrich and those he loves as they live during Luther's Reformation, learning about the free grace God offers His children in the midst of their messy lives. In the final book in The Messengers series, Simon and his friends are back. The end is drawing near. Who will win the battle? 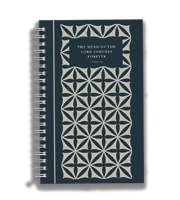 This comprehensive planning calendar provides resources for the Sundays and principal feasts of Lutheran Service Book Year C.
With a generous 16-point font, The New Testament with Psalms: Giant Print ESV is large enough to read without straining your eyes. Altogether Beautiful is a video-based women's Bible study on the Song of Songs. You'll learn how beautiful God sees you, but more important, you'll learn to ground your identity in the one who makes you beautiful—Jesus Christ. This engaging curriculum for young children includes pictures, activities, and letters for families. This is the spiritual homecoming story of Clive Staples Lewis, a careful and thoughtful scholar who spent fifteen years journeying the long road from atheism to theism and, eventually, to Christianity. Each devotion is centered around a question children might ask. Mark off the days in Advent with the lift-a-flap calendar in the back of the book!